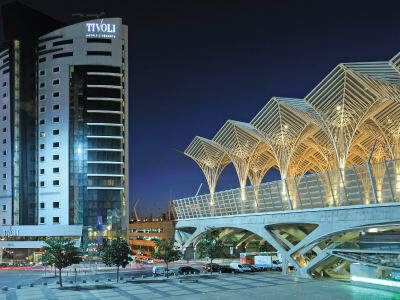 The modern Tivoli Oriente Lisboa Hotel has everything you need for your adventure in Lisbon. Located in Parque das Nações, in the new Eastern area of Lisbon and just a 5-minute drive from Lisbon Airport, the hotel has exceptional access to the city’s public transport network, main roads and to other amazing cities close to Lisbon, such as Sintra and Cascais. Whether you are travelling for work or leisure, in this recently renovated haven you’ll find comfort and a quality service to make your stay unforgettable. Start the day with our varied buffet breakfast in the Salão Tivoli. Stay connected and keep up to date with national and international news in the executive Tivoli Café. Replenish your energy with a healthy and balanced meal on the terrace or relax in the heated indoor swimming pool, the Jacuzzi or in the renovated fitness centre. In the late afternoon, take the lift to the Sky Bar Oriente to watch a stunning sunset with amazing views of the city and River Tagus with one of our delicious designer cocktails in hand accompanied by a tasty snack. If you’re looking to dine out, discover the new Guilty Restaurant. With eclectic decoration and a relaxing atmosphere, this is the ideal spot for lunch with co-workers, a group dinner or to enjoy a drink with friends. Much more than just a stay, we provide a unique experience. Thematic and contemporary Rooms and Suites to meet the needs of the most demanding guests. The blue rooms are decorated in classical shades and materials, while the red rooms have a more vibrant and romantic atmosphere. With 360º views of the city of Lisbon and the River Tagus, this relaxing bar stands out for its intriguing architecture and cosmopolitan style. With an original menu of snacks to go with our refreshing cocktails, the Sky Bar is the perfect place for a sundowner in the Portuguese capital. At Guilty you can enjoy a delicious meal in a relaxing atmosphere. Pizzas, hamburgers, pastas and salads are the stars on the menu. With its eclectic decoration, this new restaurant is a real lifestyle option. The Tivoli Café terrace, located in the most central area of Parque das Nações, is the perfect meeting point for both tourists and locals. It has a menu with lots to choose from including light and healthy meals as well as crepes, waffles and craft ice cream to die for. At the Tivoli Oriente Lisboa Hotel, you can count on an excellent capacity and accessibility of meeting rooms and events installations. In addition, we also have a professional team who will coordinate every detail to ensure the success of your event. Located just a 5-minute drive from Lisbon Airport, the exceptional access to the public transport network and main roads is a determining factor when choosing this destination. With its contemporary architecture, Parque das Nações, the newest area in the city of Lisbon, has everything you need to enjoy your visit to the full. There’s easy access to the country's main conference and events centres, including the Altice Arena, the Lisbon International Trade Fair Centre and the Portuguese National Pavilion. Visit the Oceanarium, stroll around the Vasco da Gama Shopping Centre, relax with a walk along the riverside, take a trip in the cable car or have some fun in the Casino. After a busy day, our heated indoor swimming pool is perfect to do some laps or relax with family. In our jacuzzi, with a great view to the Iconic Oriente Train Station, you can relax and enjoy your stay at its fullest. Start your day full of strength and work up a sweat in a state-of-the art equipment gym. Sauna and steam room are also available to help you decompress after your workout. Tivoli Oriente Lisboa Hotel offers you a variety of Local Experiences totally dedicated to you and your tastes, your time, expectations and travel motivations, created to reveal the authentic and local twist of cosmopolitan Lisbon. Choose one of those local experiences and feel what the original city has to offer. Indulge in a magnificent gourmet picnic with superb settings of the gardens of Seteais and Sintra's mountains. Enjoy a romantic dinner in the elegance of an XVIII century palace. Best place ever. Everyone was efficient and friendly. Food was delicious and servers were wonderful. Will be back.